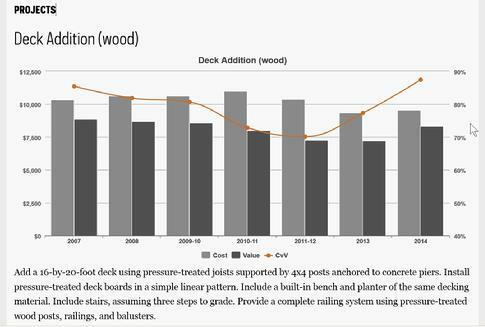 High-end composite and pvc decks cost about double their treated wood counterparts. Surprised? Why? Because they are a specialty beyond the level of expertise of most deck contractors (in my opinion), expensive to build and time consuming to quote. I am very good and it's not realistic for me to design for free. A little money... That is all. Getting a lot...It cannot be done. •Size of deck and materials- A small deck (less than 200 square feet) requires the same staircase and often the same number of piers as a deck much that is much larger. The square foot price is higher for small decks. Synthetic materials cost three to five times what pressure treated pine costs and require significantly more labor. •Staircases- One of carpentry's great mysteries (Fact: 79.5% of "deck builders" are incapable of building a "legal" set of stairs) Sound crazy? It is mind boggling to me. But I know this is a fact! Lots of decks fail final inspections with stair related problems. Don't worry my guys are experts. •Enclosing the bottom of the deck or "skirting" as it's referred to. This also takes time and significant materials. This easily adds hundreds of dollars to a small job. •The requirements of some building departments. Some towns require decks to be constructed to carry severe loads. This means larger lumber (2x10 instead of 2x6) Do you know that a 2x10 costs close to double that of a 2x6. Another trend of building departments is to make the staircases rest on piers that, like the rest of the deck supports, are required to be 42" deep. Seems excessive! But that is the rule. Staircase piers require a precision layout. We generally don't know exactly where the stairs will fall until we build the deck frame (a day or more into the job). By the way, if you are so lucky as to live in Elmhurst, the building department there has the deepest pier requirement around. 48 inches! We need some special equipment to dig there. • Obviously the quality workmanship of the contractor. • The type and amount of insurance a contractor carries. • Ease of getting to the job site. Townhomes are usually a pain!